Over the years I've had lots of offers to try pieces of running kit and various nutritional, medicinal and recovery products from a whole host of different companies. Of course, I'm very grateful for any assistance offered but usually end up declining the various company's kind offers. I have quite a strict kit list and see no need to break a winning formula. I'm referring to the likes of Brooks Glycerin shoes, Adidas Power Web base layers, Cherry Active and Oakley Jawbone Sunglasses. From time to time, I get an offer of a very interesting product which could threaten to break into my set kit list. I had such an offer back in April 2012 when Run Breeze got in touch. I discovered that they were a very young company set up by some friends who attended Loughborough University and shared a passion for running. Run Breeze are primarily a "specialist running sock company" which is now expanding to include a running clothing and accessories range. The product that they said that could be of use to me was their "Anti Blister" sock (pictured below). Regular readers of this blog will know the terrible issues that I had with blisters at the start and end of the run across the USA. With that in mind, I was replying to Run Breeze's email as soon as I saw the words "We would love to be able to provide you with a blister-free experience!". I've been trialling the socks below for 6 months now and feel that now is the right time to write about them. I've been using the Run Breeze compression socks (for recovery), light weight socks (for races up to 5k) and cushioning socks (for training runs up to 15 miles). They have all performed very well indeed and I could easily devote a blog to each type of product. It's the anti blister sock (pictured below) that I'll concentrate on. Being dual layer, they are a kind of sock within a sock. The first thing that struck me about the socks was that they were my favourite colour. That's a great start! Down to the serious stuff though. I first tried the socks on a 33 mile training run over various kinds of terrain and elevation in the North Pennines. The thing that hits you straight away is just how comfortable they are. I remember the same feeling when I put on a pair of Brooks running shoes for the first time. That comfort applies to all of the other kinds of socks I tried too, by the way, not just the anti blister socks. It's quite a difficult thing to gauge but I felt that the comfort was maintained throughout that first run. On that particular run, I was suffering in other areas and the last thing on my mind was how comfortable my socks were! Other test runs of note were 37 x 1 mile laps around Newcastle Quayside and the 14 mile mostly off road Coastal Run. I've got to admit that I don't get blisters easily. It's usually big day in day out mileage, especially in hot temperatures where I sweat buckets, when I would expect to get blisters. With that in mind I put the anti blister socks to the test in a 78 mile training run spread over 2 days in September in Death Valley, California. As temperatures hit 114 degrees Fahrenheit, yet again, thinking about just how comfortable my socks were was most definitely the last thing on my mind. Pure survival was what that run was all about. Based on my previous experience of running through the Mojave Desert and then the eastern part of the USA during the heatwave of Summer 2011, I was expecting to have one or two minor blisters at the end of the first day's 41 miles in Death Valley. Surprisingly, there wasn't a single blister to report. It was almost the same at the end of the second day's 37 miles. There wasn't a single blister on my left foot and only a very minor friction mark on the little toe of my right foot. Not bad at all for 78 of the toughest miles I've ever run! Despite the scorching temperatures, I was far drier in Death Valley that I had expected to be. That lack of moisture may have been a contributing factor to the lack of blisters. Either way, this run concluded a successful series of tests of the Run Breeze anti blister socks. I've now added Run Breeze socks to my kit list for Australia 2013. If I were to hazard a guess, given my type of running, I'd say that each pair of the anti blister socks would last anywhere between 300 and 400 miles. I have other types of socks that wash better but the strength of these socks lies in comfort and performance. And by "wash better" I mean that some of the pairs of Run Breeze socks that have done the most miles have very minor bobbling present. When I'm running across Australia with very few or even no blisters I'll not care one jot about how well the socks wash! That said, I really don't think for one moment think that running 41 miles per day for 70 days next year is going to be a blister free experience. I am confident that the number and severity of those blisters will be helped by wearing Run Breeze anti blister socks. I've been as honest and impartial as I can in this review and it should be noted that Run Breeze will be supplying socks for the run across Australia in return for this review on my website. Last week, I cheekily asked them for a bit more out of our deal and they have agreed to donate 20% of all sales (when code "RUNGEORDIERUN" is used) to The Children's Foundation (Charity No. 1000013). That 20% can be used for everything on the website; socks and other clothing. That is a fantastic gesture and I'm very grateful for the lads at Run Breeze for their generosity. 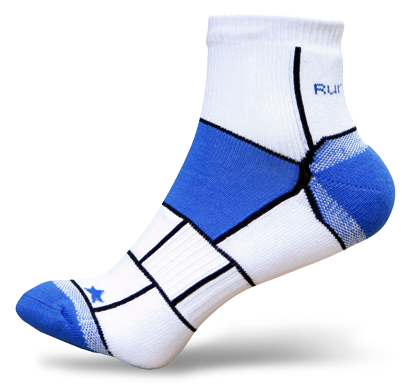 Click here to see the Run Breeze range of socks. Please don't forget to use code "RUNGEORDIERUN" at the checkout and 20% of the sale will be donated to The Children's Foundation. Everybody needs good "Neigh" bours! In 2012, Team Run Geordie Run's efforts in aid of The Children's Foundation have involved participation in The Great North Run, Mini Great North Run, Junior Great North Run and Edinburgh Half Marathon. £2761.09 has been raised which is a tremendous effort. This weekend will see Team Run Geordie Run's Craig Bowes run the Melbourne Marathon. Craig, originally from Crook, County Durham, moved to Melbourne 2 years ago and up until then was a regular runner in the Great North Run. In recent years, he has stepped up to a full marathon and is pictured below at the end of the Paris Marathon in 2009. Sunday's race will be Craig's 3rd consecutive Melbourne Marathon and despite, now, living on foreign shores the exiled Geordie felt compelled to raise funds for a charity in his native North East . I'll let Craig explain: "Having raised money for an Australian charity last time around I thought it was time to return home, which is why I’m now trying to raise money for the Children’s Foundation in Newcastle. I feel honoured to be running as part of the Run Geordie Run team and will do my small bit to raise as much sponsorship as possible for this very worthy cause.". 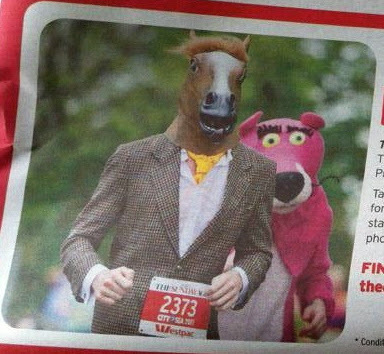 Running a marathon is difficult in itself but Craig is considering wearing a bit of extreme fancy dress after he was pictured in the local paper last week. That's Craig below wearing a horses head during the 2011 City2Sea event in Melbourne! Best of luck Craig and well done so far on already exceeding your sponsorship target for The Children's Foundation. I'm sure there's more to come. Especially if you run all 26.2 miles in the Horse's Head. If you would like to sponsor Craig then please visit www.justgiving.com/craig-bowes.